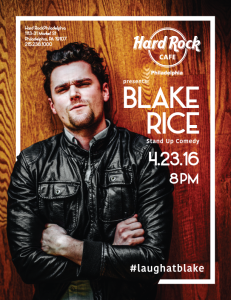 Moorestown-raised comedian Blake Rice returns from New York City to Hard Rock Cafe Philadelphia to perform some of his hilarious stand up comedy in front of his hometown crowd. Rice will be performing on Saturday, April 23 at the Hard Rock Café in Philadelphia, located at 113–31 Market Street. Doors open at 8 p.m. Tickets are $15 at tickets link . Opening comedians to be announced. See more by going to his Facebook page www.facebook.com/blakewrice/.